Dr. Born is currently the Intrepid Heroes Professor of Orthopaedic Surgery at the Warren Alpert Medical School of Brown University and the Emeritus Director of Orthopaedic Trauma at the Rhode Island Hospital. He is a graduate of the University of North Carolina at Chapel Hill and received his MD degree from Georgetown University in 1979. He completed five years of orthopaedic training at the University of Pennsylvania. From 1984 until 1996 Dr. Born was the Assistant Division Head of Orthopedic Surgery at Cooper Hospital University Medical Center in Camden, New Jersey, and was an Associate Professor of Orthopedic Surgery at the University of Medicine and Dentistry/Robert Wood Johnson Medical School. In 1996, Dr. Born rejoined the faculty at the University of Pennsylvania as an Associate Professor of Orthopaedic Surgery and prior to joining the faculty at Brown University in 2005, he was a Professor of Orthopedic Surgery at Temple University in Philadelphia. Dr. Born is a Fellow of the American Academy of Orthopedic Surgeons (AAOS) and is a past Board member of the Orthopedic Trauma Association (OTA). He currently serves as the Chairman of its Mass Casualty Response Committee and is the past Chairman of its Fellowship Committee. Dr. Born is honored to have been a Distinguished Visiting Scholar at the US Military Hospital in Landstuhl, Germany and serves on the combined AAOS/OTA Extremity War Injury and Disaster Preparedness Work Group where he chairs the section on disaster response. He is also a Fellow of the American College of Surgeons and for eight years served on its Committee on Trauma in addition to being the Section Chairman for Orthopaedic Surgery. He is currently a consultant to the College’s Committee on Trauma ad hoc Disaster Sub-Committee and is a past Specialty Society Governor for orthopaedic surgery. He writes and lectures extensively on issues of musculoskeletal trauma and disaster management both nationally and internationally. He has traveled to Iran and to Haiti with the US Government’s International Medical Surgical Response Team to give humanitarian medical aid to earthquake victims. Dr. Born is the immediate past-President of the Foundation for Orthopaedic Trauma and currently chairs its Humanitarian Committee. Dr. Born also heads the Diane N. Weiss Center for Orthopaedic Trauma Research at Rhode Island Hospital and is the Director of the Stein/Bellet Fellowship for Orthopaedic Trauma Research. His areas of research interest include antimicrobial coatings for orthopaedic trauma implants and biomechanical analysis of a variety of fracture fixation methods. 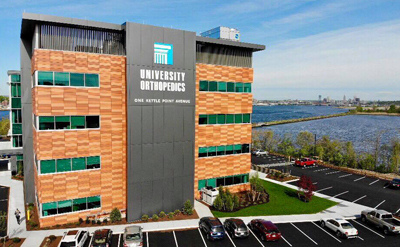 Dr. Born is currently seeing patients non-operatively as the Director of the University Orthopedics "Ortho Direct" program at the Kettle Point campus. Received his Bachelor of Arts from the University of North Carolina at Chapel Hill in 1970 and completed his premedical studies at Columbia University in New York City. Completed five years of orthopedic training at the University of Pennsylvania. Dr. Born writes and lectures extensively on issues of musculoskeletal trauma and disaster management both nationally and internationally. He has authored nearly 100 peer-reviewed papers, 20 book chapters and given over three-hundred lectures at professional meetings. Born CT, Moller ML: A Simple Procedure for the Long Term Intravenous Infusion in the Rat. Laboratory Animal Science 24: 355-358, 1974. Year Book of Cancer, PP 625-626, Year Book Medical Publishers, Chicago, Ill, 1975. Ross SE, Schwab CW, David ET, DeLong WG, Born CT: Clearing the Cervical Spine: Initial Radiologic Evaluation. J. Trauma 27: (9) 1055-1059, 1987. Ross SE, O'Malley KF, DeLong WG, Born CT, Schwab CW: Clinical Predictors of Cervical Spine (CSI) in Blunt High Energy Transfer Injuries (BHETI). Annals of Emergency Medicine 16: (4) 498, 1987. O'Malley KF, Born CT, DeLong WG, Halsey D, Shaikh KA, Schwab CW: Patterns of Injury in Highway Trauma: Automotive, Motorcycle, Pedestrian, Moped and Bicycle. 29th Proceedings of the American Association for Automotive Medicine pp 323-334, 1985. O'Malley KF, Born CT, DeLong WG, Shaikh KA, Schwab CW: A Triage Tool for Trauma Center Transfer. Topics in Emergency Medicine 9: (1) 71-78, 1987. Smejkal R, Izant T, Born CT, DeLong WG, Ross SE: Pelvic Crush Injuries with Occlusion of the Iliac Artery. J. Trauma 28: (10) 1479-1482, 1988. Born CT, DeLong WG, Shaikh KA, Moskwa A, Schwab CW: Early Use of the Brooker-Wills Interlocking Intramedullary Nail (BWIIN) for Femoral Shaft Fractures in the Acute Trauma Patient. J. Trauma 28: (11) 1515-1522, 1988. Reviewed in Orthopaedic Capsule and Comment II: (4) l989. DeLong WG, Born CT, Marcelli E, Shaikh KA, Iannacone WM, Schwab CW: Ender Nail Fixation in Long Bone Fractures: Experience in a Level 1 Trauma Center. J. Trauma: 29 (5) 571-576, 1989. Born CT, Petrik M, Freed M, DeLong WG: Syncope and Cerebrovascular Accident Complicating Klippel-Feil Syndrome: A Case Report. JBJS, 70-A: (9) 1412-1415, Oct 1988. Born CT, Ross SE, Iannacone WM, Schwab CW, DeLong WG: Delayed Identification of Skeletal Injury in Multisystem Trauma: The "Missed" Fracture. J. Trauma: 29 (l2) 1643-1646, Dec 1989. Iannacone WM, DeLong WG, Born CT, Bednar JM, Ross SE: Dynamic Computerized Tomography of the Occiput-Atlas-Axis Complex in Trauma Patients with Odontoid Lateral Mass Asymmetry. J. Trauma: 30 (12) 1501-1505 Dec 1990. DeLong WG, Born CT, Iannacone WM, Bednar JM, Guzmer P: Early Experience with Russell Taylor Interlocking Femoral Nail System. UPOJ: (8) 25-29, 1992. Mitchell JR, Delong WD, Iannacone WM, Born CT: A Review of Delayed, Locked Intramedullary Nailing of Severe Tibial Shaft Fractures Following Initial External Fixation. UPOJ: 8 11-15, 1992. Ross SE, O'Malley KF, DeLong WG, Born CT, Schwab CW: Clinical Predictors of Unstable Cervical Spine Injury in Multiple Trauma Patients. Injury: 23 (5) 317-319, 1992. Kottmeier SA, Wilson SC, Born CT, Hanks GA, DeLong WG, Iannacone WM: The Morel-LaVallée Lesion. Orthop. Tran:. 16 (1) 49, 1992. DeLong WG, Born CT, Mitchell J, Iannacone WM: Delayed Reamed Intramedullary Rodding in Open Fractures of the Tibia after Initial Treatment with External Fixation. UPOJ, 1992. Kottmeier S, Born CT, Saul H: Laparoscopic Retrieval of a Migrating Intra-Pelvic Pin: A Case Report and Review of the Literature. J. Trauma: 35 (6) 952-955, Dec 1993. Born CT, Mure AJ, Iannacone WM, DeLong WG: Three Dimensional Computerized Tomographic Demonstration of Bilateral, Atlanto-Axial Rotatory Dislocation in an Adult. J. Orthop Trauma 8: (1) 67-72, Feb 1994. Bennett FS, Born CT, Alexander J, Crincoli M: False Aneurysm of the Medial Inferior Genicular Artery after Intramedullary Nailing of the Tibia: J. Orthop. Trauma: 8 (1) 73-75, Feb 1994. Iannacone WM, Taffet R, DeLong WG, Born CT, Dalsey RM, Deutsch LS: Early Exchange Intramedullary Nailing of Distal Femoral Fractures with Vascular Injury Initially Stabilized with External Fixation. J. Trauma 37: (446-451, Sep 1994. Iannacone WM, Bennett FS, DeLong WG, Born CT, Dalsey RM: Initial Experience with the Treatment of Supracondylar Femoral Fractures Using the Supracondylar Intramedullary Nail: A Preliminary Report. J. Orthop Trauma 8: (4) 322-327, Aug 1994. Wright DG, Covey DC, Born CT, Torg J, Sadasvian R: Open Dislocations of the Knee. J. Orthop. Trauma 9: (2) 135-140, Apr. 1995. Catalano JB, Iannacone WM, Marczyk S, Dalsey RM, Deutsch LS, Born CT, DeLong WG: Open Fractures of the Patella - Long Term Functional Outcome. J. Trauma. Vol. 39: (3) 439-444 Sep 1995. Reviewed in Bone & Joint Diseases: Index and Reviews 5: (1) 1996. Born CT, Ross SE, Aron B, DeLong WG, Iannacone WM: Patterns of Injury and Disability Caused by Forklift Trucks. J. Trauma 40: (4) 636-639, Apr 1996. Kottmeier SA, Wilson SC, Born CT, Hanks GA, Iannacone WM, DeLong WG: Surgical Management of Soft Tissue Lesions Associated with Pelvic Ring Injury. Clinical Orthop. and Related Research: (329) 46-53, Aug 1996. Ramsamooj R, Llull R, Tatem L, Black K, Lotano V, Dalsey R, Born C, DeLong W, Hewitt C: Graft-Versus-host Disease in Extremity Transplantation: Digital Image Analysis of Bone Marrow and TGF-B Expression In Situ Using A Novel 3-D Microscope. Transplantation Proceedings 28: (4) 2029-31, Apr 1996. Blazar PE, Dormans JP, Born CT: Train Injuries in Children. J Orthop Trauma 11 (2): 126-129, 1997. Born CT, DeLong WG: Orthopaedic Trauma Education: Visions for the Future through the OTA UPOJ, 11:103-05, 1998. Reprinted in J. Orthop Trauma, 13 (6): 433-436, 1999. Wei SY, Born CT, Abene AJ, Ong A, Hayda R, DeLong WG: Diaphyseal Forearm Fractures Treated With and Without Bone Graft. J. Trauma. 46 (6): 1999. DeLong W, Petrik M, Ponzio R, Wei S, Born C: The Aggressive Treatment of 119 Open Fracture Wounds J. Trauma, 46 (6): 1999. Born CT, Barrick EF, Cramer KE, Miller ME, Sims SH, Stephen DJ, Tornetta P, White RR, Whittle AP: Resident Education Curriculum for Orthopaedic Trauma Orthopaedic Trauma Association, Fellowship and Career Choices Committee. (Born CT, Chairman) J. Orthop. Trauma, 13,6: 441-455, 1999. Born CT, Barrick EF, Cramer, KE, Miller ME, Sims SH, Stephen DJ, Tornetta P, White RR, Whittle AP: Guidelines for Orthopaedic Trauma Fellowships, Orthopaedic Trauma Association, Fellowship and Career Choices Committee. (Born CT, Chairman) J. Orthop. Trauma, 13, 6: 437-440, 1999. Wei SY, Okereke, E, Esmail N, Born CT, DeLong, WG: Operatively Treated Calcaneus Fractures: To Mobilize or Not to Mobilize. UPOJ 14; pp 71-75, 2001. Scherbel U, Reiss P, Khurana J, Born CT, DeLong WG: Expression of Bone Morpogenic Proteins in Rats with and without Brain Injury and a Tibia Fracture: UPOJ 14; pp 85-89, 2001. Robinson PS, Placide R, Soslowsky LJ, Born CT: Mechanical Strength of Repairs of the Hip Short External Rotators: Journal of Arthroplasty, 19:2, 2004: 204-210. DeLong WG, Born CT: Advances in Surgery and Molecular Medicine: Clin Orthop, 422, 2004:2. Baskin KM, Cahill AM, Kaye RD, Born CT, Grudziak JS, Towbin RB: Closed Reduction with CT-Guided Screw Fixation for Unstable Sacroiliac Joint Fracture Dislocation: Pediatr Radiol 34, 2004: 963-969. Born CT: Blast Trauma – The Fourth Weapon of Mass Destruction, Scandinavian Journal of Surgery 94, 2005: 279-285. Born CT, King PJ, Rehman S, Khoury L, DeLong WG: Arthroscopically-Assisted Removal of Retrograde Intramedullary Femoral Nails: J Orthop Trauma, 2006;20:211-214. Rehman S, MacIntyre NR, Born C: The use of a modified humeral locking plate for tibio-talar fusion: a case report: Temple Journal of Ortho and Sports Medicine, 2006:1;65-67. Mehta S, Auerbach J, Born CT, Chin KR: Sacral Fractures, JAAOS, 2006:14;656-665. Ciraulo DL, Barie PS, Briggs SM, Bjerke HS, Born CT, Capella J, Cancio L, Dennis A, DiGiacomo JC, Gross RI, Hammond JS, Holcomb JB, Jenkins D, Knuth TE, Letarte PB, Lynn M, O’Neill PA, Salamone JP, Shatz DV; Eastern Association for the Surgery of Trauma: Disaster and Medical Special Operations Committee (DMSOC): An Update on the Surgeons Scope and Depth of Practice to All Hazards Emergency Response. J Trauma. 2006 60(6);1267-1274. Born CT, Briggs SM , Ciraulo DL, Frykberg ER, Hammond J, Hirshberg A, Lhowe DW, O’Neill P: Disasters and Mass Casualties: I. General principles of response and management. J Am Acad Orthop Surg 2007;15:388-396. Born CT, Briggs SM , Ciraulo DL, Frykberg ER, Hammond J, Hirshberg A, Lhowe DW, O’Neill P, Mead J: Disasters and Mass Casualties II:Explosive, biologic, chemical and nuclear agents. J Am Acad Orthop Surg 2007;15:461-473. Tan V, Wong KL, Born CT, Harten R, DeLong WG: Femoral Neck Fracture Fixation with Two Screws: a biomechanical analysis of two different pin configurations, Am J Orthop 2007;36(9):481-485. Namdari S, Valdes M, Born CT: Parturition-induced pubic symphysis separation and sacral ala fracture: case report and review of the medical literature, Journal of Pelvic Medicine and Surgery 2007;13(6);383-390. Covey DC, Aaron RK, Born CT, et al: Orthopaedic War Injuries: From combat casualty care to definitive treatment: A current review of clinical advances, basic science, and research opportunities. Instr Course Lect 2008;57:65-86. Patel A, Fischer SA, Calfee RP, Plante M, Born CT: Methcillin Resistant Staphylococcus aureus in orthopaedic Surgery. J Bone Joint Surg (B) 2008;90-B:1401-1406. Covey DC, Aaron RK, Baechler MF, Born CT, et al: Orthopaedic War Injuries: New Developments in Treatments and Research, Instruct Course Lect 2009;58:117-129. Lee M C, Campbell R, Born CT: Guillain-Barré Syndrome after failed pelvic fracture fixation, JTrauma. 2009;67. Covey DC, Born CT, Blast Injuries: Mechanics and wounding patterns, Journal of Surgical Orthopaedic Advances. Manuscript accepted, 2009. Born CT, Cullison TR, Dean JA, Hayda RA, McSwain N, Riddles LM, Shimkus AJ: Partnered Disaster Preparedness: Lessons learned from international events. J Am Acad Orthop Surg, 2011; 19 Supplement 1:S44-48. Born CT, Monchik KO, Hayda RA, Pollak AN, Bosse MJ, Essentials of Disaster Management: The role of the orthopaedic surgeon. Instructional Course Lectures, American Academy of Orthopaedic Surgeons, 2011;60:3-15. Bariteau JT, Beutel BG, Kamal R, Machan JT, Born C. Use of near-infrared spectrometry for the diagnosis of lower extremity compartment syndrome, Orthopedics 2011;34(3):178. Deirmengian GK, Lee CS, Deirmengian CA, Born CT: Antegrade Removal of an Incarcerated Intramedullary Femoral Nail Through the Knee: a case report and description of the technique. Techniques in Knee Surgery, 2011;10(3):159-162. Aaron DL, Fadale PD, Harrington CJ, Born CT: Posttraumatic Stress Disorders in Civilian Orthopaedics. J Am Acad Orthop Surg, 2011;19(5):245-250. Pollak AN, Born CT, Adashi EY, Kamal RN; Updates on Disaster Preparedness and Progress in Disaster Relief. JAAOS, 2012, in press. Born CT, Editor, Operative Techniques in Orthopaedics: Pelvic Trauma. WB Saunders, Philadelphia PA. 1993. Born CT, Editor, Operative Techniques in Orthopaedics: Pelvic Trauma: Update. WB Saunders, Philadelphia, PA. 1997. Born CT "Living with your Halo Brace." Division of Orthopaedic Surgery, Cooper Hospital/University Medical Center, 1993. Born CT, Dalton GP: Reconstruction of Fractures of the Posterior Acetabular Wall. Operative Techniques in Orthopaedics, 3 (1), pp 46-52, 1993, Saunders, Phila. Lazarus M, Born CT: Advances in the Management of Musculoskeletal Trauma. Current Opinion in General Surgery. (1), pp 46-53, 1993, Current Science, Phila. Catalano JB, Born CT, Ross SE: Diagnosis, Temporary Stabilization and Definitive Management of Injuries of the Cervical Spine. Advances in Trauma and Critical Care, 9, 1994 Mosby-Year Book, Inc. St. Louis. Guerra JJ, Born CT: The Management of Traumatic Subtrochanteric Fractures, Operative Techniques in Orthopaedics 4(2), pp 116-121, 1994. Saunders, Phila. Reilly TM, Born CT: Forearm Fractures. In Dee R (Ed) Principles of Orthopaedic Practice McGraw-Hill, New York, 1997. Pan WT, Born CT, DeLong WG: Fractures and Dislocation. Involving the Elbow Joint.In Dee R (Ed) Principles of Orthopaedic Practice. McGraw-Hill, New York, 1997. Catalano JC, Born CT: Hip Replacement Following Failed Acetabular Surgery in Pelvic Trauma Update, In Born C (Ed), Operative Techniques in Orthopaedics. 7 (3) WB Saunders, Philadelphia, PA 1997. Born CT, Tahernia D: Radiographic Evaluation of Calcaneal Fractures. Clinics in Podiatric Medicine and Surgery, W.B. Saunders, Philadelphia, PA. 14(2): 1997. Grossman MD, Born CT: In Surgical Clinics of North America, Schwab CW (ed): "Tertiary Survey of the Trauma Patient in the Intensive Care Unit", Saunders, Philadelphia 2000, 805-824. Born CT, Brogle P. Orthopaedic Hardware Involved in Trauma In Dalinka MK (Ed): Radiology: Diagnosis, Imaging and Intervention. Vol. 5. , pp. 1-17, Lippincott, Philadelphia, 2001. Hamilton WG, Born CT, DeLong WG: Total Hip Arthroplasty After Surgically Treated Acetabular Fractures. Seminars in Arthroplasty, Saunders, July 2001, Vol.12, No. 3 pp 191-201. Born CT, DeLong WG, Brogle PG. Acetabular Fractures. Orthopaedics, Fitzgerald RH, (Ed), Mosby Philadelphia, PA, 2002 pp 338-346. Born CT, Lhowe D, Dyer, MD: Extremity Trauma. In Briggs S (Ed) Advanced Disaster Medical Response Training Manual, Trauma and Disaster Institute, Harvard Medical International, 2003 pp103-111. Born CT, Calfee R: Disaster Management. In Browner BB, et al (Eds) Skeletal Trauma, Elsevier, Philadelphia, PA, 2008. Langer P, Born CT: Intramedullary Fixation of Humeral Shaft Fractures. In Williams G and Ramsey M (Eds) Operative Techniques in Orthopaedic Surgery, Lippincott Williams and Wilkins, Philadelphia, PA 2009. Born CT, Hook plates for olecranon fractures; In Tornetta P and Ricci (Eds) Operative Techniques in Orthopaedic Surgery, Lippincott, Williams and Wilkins, Philadelphia, PA 2010.